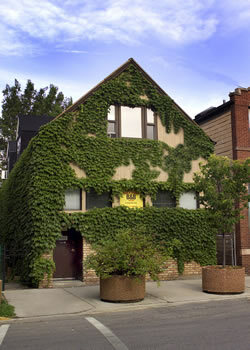 Ray’s B&B is located in Chicago’s vibrant Bucktown/Wicker Park neighborhood, 12 minutes to downtown by train. Modeled after small European hotels, we have 11 unique bedrooms, (each with a private bathroom, WIFI, TV, DVR & robes), free parking, a business center (copier, fax, & computer), steam room, sauna, laundry facility, and comfortable community areas. Price includes our highly acclaimed full breakfasts cooked-to-order from a menu, including options for vegetarian or other dietary needs. If you’re not an early morning person, you’re in luck. Ray’s serves breakfast when you want it. Coffee, tea and bottled water are free all day. Ray’s is within walking distance of more than 80 restaurants, unique boutiques & shops, spas and neighborhood bars. We are only a 6-block walk to the Blue Line “L” train to Downtown or O’Hare Airport or to Midway with a easy transfer. By car, we are 2 blocks off I-90/94 (Kennedy Expressway). This is not your parents’ Bed & Breakfast!